The perfect solution for EMR portable charting. 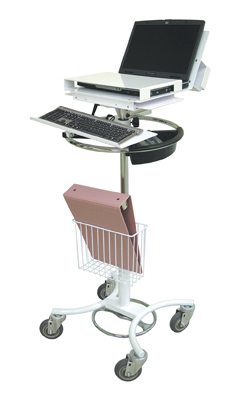 Carts & Carts industry-leading line of portable computer and laptop stands are the perfect solution for your EMR charting needs. Our stands come with a multitude of accessories to provide added convenience to your mobile computing. Our modern, adjustable laptop stands have become the benchmark for managing today's electronic medical records. Our ergonomic friendly products are designed significantly to improve efficiency and patient point-of-care. Contact the EMR charting specialists at Charts & Carts for personal assistance in determining the best laptop computer stand for your medical facility. SKU # LCS-0707N, The ultimate in portable EMR charting! SKU #LTS-0305, Dual lock included to secure laptop to tray. SKU # CTC-5714, includes 10' cord reel & three (3) power oulets! SKU # SLS-0306, Locking work surface keeps laptop & data secure.